It was a case of no snow, not the wrong kind of snow. Out and about this week I came across this gentleman, with a nifty way of getting about. 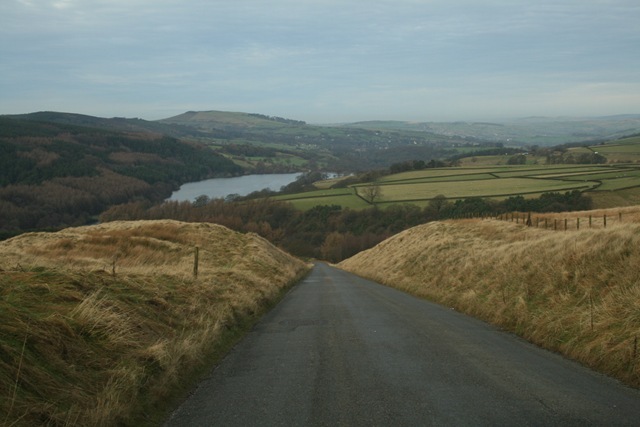 The hills gradient is 1:7 and what is now road was once a railway track, with a stationary steam engine at the summit, the engine was used to haul the trucks up the incline, it was built in 1831, to link two canal systems. Could I get up that hill in these shoes? I don’t think so! But I have to say this is a wicked hill to sledge down, especially on either a plastic bivvy bag or a fertiliser sack, I know I have done it and Tom found it rather an exciting run on his mountain bike, in what was not a totally controlled decent, it was miraculous that both he and the bike arrived at and got round the bend at the bottom together. Categories: Away Days, Crack a Smile, Family, Fell running, History, Humour, Photographs, Travel, Weather | Tags: Cross country skiing, Hot chocolate, Inclines, Mountain bikes | Permalink.